Olga Dinze, the lawyer of the Ukrainian activist Volodymyr Balukh, convicted in Crimea, reported that her client was beaten by guards who took him out of the "court" hall after considering the appeal. According to the lawyer, the defense intends to file a complaint in connection with the beating of the defendant. Dinze said that the prison administration also refused to provide Balukh with water on the grounds that he went on a hunger strike. "The state of the convicted activist is bad, but not critical," she said. The expert of the Crimean Human Rights Group Oleksandr Sedov noted earlier that the occupiers in the Crimea are constantly pressuring on the Ukrainian prisoner Volodymyr Balukh to make him stop the hunger strike. Reference: Volodymyr Balukh is a Crimean farmer, who hung out a Ukrainian flag on his house in 2014, which was repeatedly ripped off by Crimean security officials. In November 2016 Volodymyr attached to his house a sign with the inscription "18, Heroes of Heavenly Hundred Street”. According to him, he then started receiving threats from local “administration” saying that if he did not remove it, then some drugs or weapons could be found in his house. 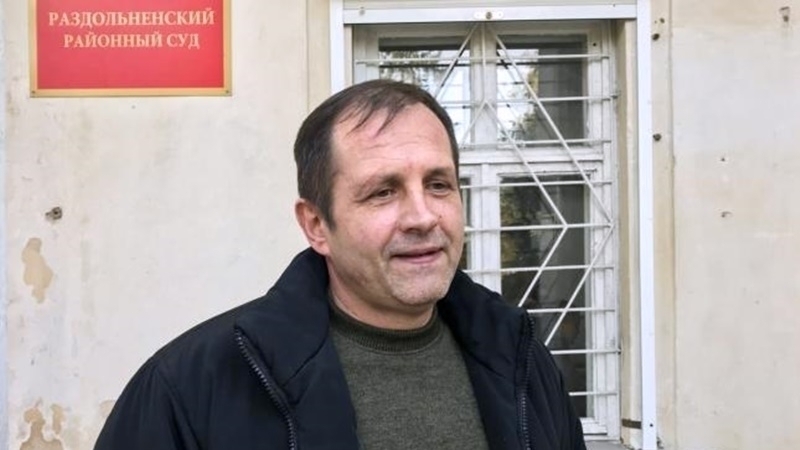 After the searches and accusations of illegal possession of ammunition, the "court" in the occupied Crimea sentenced Vladimir Balukh to 3 years and 7 months of imprisonment for his civil position. Volodimir Balukh will serve time in the colony-settlement. The Ukrainian activist was taken into custody in the courthouse. On March 19 of this year, Balukh declared an indefinite hunger strike, protesting against the verdict of the court. Human rights activists note that Volodimir Balukh continues his hunger strike, having serious health problems. As a result of the hunger strike, Balukh has lost a lot of weight.